How many of us have wished we could wind back the clock? Smooth out the rough-and-tumble? Undo the damage, lose the weight? We can. You can find out how–and at what cost–in Daniel Pearlman’s chilling novelette, “The Colonel’s Jeep,” which is set in the steppes of Russia during World War II—a most unlikely place for healing, no? You’re right. Fans of Serling and Bradbury will not want to miss this one. I promise. 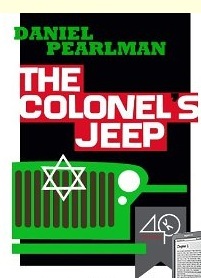 Posted on July 9, 2011, in Short Stories, Short Takes and tagged 40K Books, Daniel Pearlman, Short Stories, Supernatural, The Colonel's Jeep. Bookmark the permalink. Leave a comment.